In the textile sector present time is the time of modern & new era. 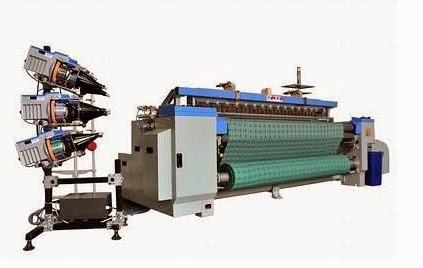 Man has invented a lot of modern loom using with modern weft insertion system. So the comparison of conventional loom & modern loom indicates how much the conventional loom is modified within the passing of time. It is still not certain when the weaving process was introduced to human society. It is clear from many historical records that weaving originated long before the time of Jesus Christ. In England the major shift from agriculture to woolen industry came in the 14th century. Earlier version of power loom was run by two men. After the steam engine and cast iron in early 1800, great attention was paid to increasing productivity of the machine. To help achieve the increase in productivity, William Radeliffe patented a dressing frame in 1803 for sizing and drying the warp threads prior to winding on to a weavers beam. The shuttle loom is the oldest type of weaving loom which uses a shuttle which contains a bobbin of filling yarn that appears through a hole situated in the side. The shuttle is batted across the loom and during this process, it leaves a trail of the filling at the rate of about 110 to 225 picks per minute (ppm). Although very effective and versatile, the shuttle looms are slow and noisy. Also the shuttle sometimes leads to abrasion on the warp yarns and at other times causes thread breaks. As a result the machine has to be stopped for tying the broken yarns. Shuttleless weave 2 to 4 times as much as conventional looms per unit time. Heavy cost of repairs and replenishment of worn out parts is reduced They can produce simpler tubes of fabrics on a large scale and provide opportunities for profitable exploitation in the long run. Speed is not the only criterion for the selection of shuttleless looms. Efficiency is also an important criterion.Efficiency advantage of 10-15% due to shuttle changes, Un weaving of damages, reduced time for warp changes canbe obtained from shuttleless looms. 5% higher efficiency would provide an additional profit of Rs. 1/- per metre. 14 minutes stoppage per 24 hours. Ex works cost is less due to less mending and inspection charges and no pirn winding charges. Modern looms still weave by repeating in sequence the operations of shedding, picking, and beating in, but within that framework there has been considerable development during the 20th century. Several new types of loom have come into industrial use, whereas older types have been refined and their scope extended. Two main influences have been the rising cost of labour and the increasing use of man-made continuous- filament yarns. Sulzer brothers, Winterthur, Switzerland, Who are pioneer in the field of projectile method of weft insertion, have been able to convert a brilliant concept Roshman into a viable commercial weaving machine. It is introduced in the market in 1953.The main feature of this machine is weft insertion system. A bullet like shuttle 90 mm long & weighting about 40 g, technically named as gripper projectile is used here to insert the weft thread into the warp threads. 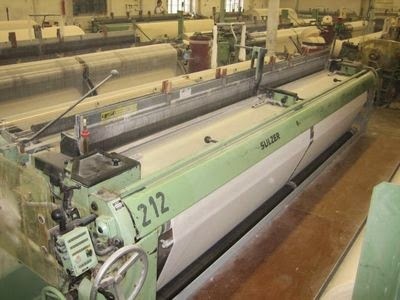 Sulzer projectile weaving machine differs from a conventional automatic loom mainly in two respects. The picking are projectile receiving units are separated from the moving sley. The sley carries the reed & gripper guides. The gripper projectile made of fine steel, 90 mm long 14mm wide and 6 mm thickness weight is 40 g. It carries the weft thread into the warp shed. The weft is drawn directly from a large stationary cross wound package. There is no weft winding. The gripper projectile is picked across the warp shed at a very high speed ,the picking energy being derived from the energy stored in a metal torsion bar which is twisted at predetermined amount of released to give the projectile a high rate of acceleration . Picking always takes place from one side, but several projectiles are employed and all of them return to the picking side by a conveyor chain located underneath the warp shed. During its flight through the shed the projectile runs in a rake likes steel guides, so that the warp threads are touched neither by the projectile nor weft thread. Every pick is cut off at the picking side near the selvedge after weft insertion, leaving a length about 15 mm from the edge. Similar length of weft also projects from the selvedge on the receiving side. The ends of weft thread projecting on both sides of the cloth are tucked into the next shed by means of special tucking device and woven in with next pick, thus providing firm selvedges. The reed is not reciprocated as in a shuttle loom, but rocked about its axis by a pair of cams. The reed & projectile guides are stationary during pick insertion. The sley which carries the reed & projectile guides is moved forward & backward through a saddle carrying two follower bowls, which bear against the surface of two matched cams. A sley dwell of 25 degree at back center enables the projectile to travel through the warp shed without being unnecessary reciprocated by the sley. Whenever the reed width is reduced for weaving a small width cloth from the standard reed width, the projectile receiving unit is moved inward on the telescope shaft, to the new selvedge position, and so the projectile travel distance is reduced. Smaller shed opening because of the smaller size projectile. This might result in lower warp breakage rate. Weft insertion rate up to 900-1500 m/min is possible depending up to the width of the weaving machine. The color changing mechanism is less complicated. In case of weft breakage the take up beam & heald frames can de driven in reverse by a pick finding mechanism. 1. Two or three cloths can be woven simultaneously. 2. It is possible to achieve weaving performances with breakage rate per square meter of cloth. 50% of the number of breaks that would occur on a conventional loom. Beat up line being nearer to the centre of the reed between the two baulks. Smaller warp shed will reduce the warp threads tension to some extent. However care should be taken to maintain uniform tension to ensure that the warp shed is of same depth from one end to another. Otherwise a few slack warp threads at the top shed will result in stitching and end cut of the projectile. 4. Since the projectile is passing through guides there is no reed to projectile or projectile to yarn contact. 5. With the introduction of four/six colors weaving machine all the mechanical problems of the conventional pick & pick multicolored loom are eliminated. 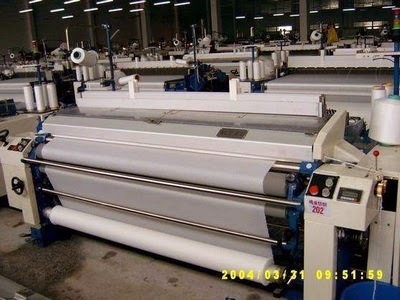 The main feature of projectile loom is inserting the weft thread by projection method. If the fault from the machine can be reduced then it will have the more weaving speed. Insertion of weft by rapier is a mechanically modern & refined version of the primitive method of fabric production in which the weft was secured in a slot of a stick. At present version of the gripper head which are attached to rapiers which are flexible tapes or rigid rods. Mr. John Gabler can be regarded as the father of modern rapier technology he has built a rapier device on a cotton weaving machine in 1922. Single rapier loom can insert weft only on alternate rapier traverse. In many cases this is modified to achieve a higher rapier velocity in the early and late parts of the movement and thus a over maximum velocity halfway through the movement. Due to high rate of insertion the possibility of yarn breakages rate may increase. Additionally, it is necessary to control the weft by passing it trough an effective tension arrangement so that the weaving tension will be more uniform, this can also occurred weft break. An useful feature of rigid rapiers is that they can be simultaneously inserted in two sheds one above the other, for producing double plush and certain carpets. Rapier loom may have various types according to the weft insertion mechanism & number of pick such as insertion of double pick, insertion of single pick, two phase rapier etc. In all rapier looms to-and-fro-movement of the rapiers is derived initially either from a linkage mechanism or from a cam. The use of linkage mechanism has the advantages of simplicity reliability & is cheap, quite and consumers less energy than a cam mechanism but it does not provide any dwell to the rapiers. The only two phase rapier in commercial operation is the saurer of width 2 x 185 cm or 2 x 220 cm having weft insertion rate is about 1200 mpm. The rigid rapier is driven from the centre and has a rapier head at each end.In one cycle of 360 degree the rapier inserts one pick alternately in the right hand and the left hand fabrics, the picks being inserted and beaten up in opposite phase . In gabler system of weft insertion the rapier system is combined with air jet picking system. Gabler system rapier may be single sided or double sided. The machine include on gabler system Draper DSL,Gusken etc.Those operating on dewas system include dornier, picanol, Novo pignon SACM, Gunne, Smit, Sommet, Sulzer-Ruti etc. 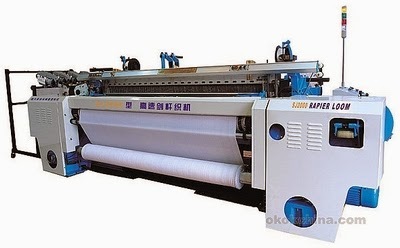 Integrating the features of rapier looms of Model SJ758 and other imported and domestic rapier looms, Model SJ736-III rapier loom is specially designed for weaving of light, medium and heavy fabrics and check designs, it adopts automatic pick finder and electronic color selector. The loom is controlled by the control panel with a micro-computer, the lcd display provides a very user-friendly human-machine interface, which shows the production statistic data of each shift and provides the weft color programming function. The machine adopts electronic color selector up to 8 colors, and the color selection pattern is programmed directly on the machine control panel. Wefting mechanism adopts 6-lever wefting structure and can ensure the adjustment of the rapier entry and exit time and ensure stable wefting and insertion motion. This machine adopts 4 levers, short connectors and short sley to complete the beating motion, the rock shaft adopts 110mm(diameter) seamless tube to ensure the beating strength and can be suitable for high-speed motion and weaving of heavy and high density fabrics. The rapier transmission box adopts the advanced helix umbrella gears to ensure stable transmission. The tension device adopts 3-rear-beam tension structure, which is specially designed for balancing the warp tension of high-density weaving and can improve the quality of the weaving fabrics. The machine adopts electronic let-off mechanism with a high-accuracy step motor and the optimized mechanical take-up system for stable and accurate pick finding motion. The pick finding motion is very stable and proved to be very successful and reliable. The adoption of two pressing rollers on the fabric winding roller enables the worker to unload the fabric from the fabric roller without stop. The frequent adoption of bearings for the major moving parts provides better performance and easier maintenance. Some of the disadvantages of rapier loom if may reduced then this machine will be more effective for weaving. The rapier loom doesn’t require dynamic forces or anything like the magnitude as those involved in the conventional loom. The weft insertion rate in a rapier loom is very much influenced by the method of weft control. It can occur double pick at a time by double picking insertion system. Here is no need to cut the weft selvedges and no weft wastage. Weft insertion rate is very high rather than any conventional loom Rigid rapiers has a useful features that they can be simultaneously inserted in two sheds one above the other ,for producing double plush and certain carpets. Looms that use rigid rapiers eliminate entirely the need to assist the rapier head through the warp shed, this is a un doubted advantages. Weft insertion by means of air jet has made a major breakthrough in the early 70s and its importance is increasing further because of its ability to weave a wide range of fabrics at a very high speed weft insertion rate of about 2000 mpm. The first attempt to use a compressed air steam instead of shuttle is made by Brooks in 1914. To insert the weft threads here used compressed air. Not suitable for the coarser count or heavier fabric. The timing of jet activity should be controlled in such a way that the main nozzle is supplied with compressed air from the beginning of the weft insertion phase and the relay nozzles also receive compressed air. For instance on a weaving machine having a speed of 600 rpm the weaving cycle is 100m/s. Cam control valves have the advantages of high speed precision of action whilst the electrically controlled solenoid valves permit easy setting. Finer count of yarn is used as the weft thread to produce fency type of fabric. The conventional loom requires shuttle or shuttle like substance to insert the weft yarn, comparatively in air jet loom there is no need to any kind of shuttle instead of shuttle here the compressed air force is used. In the conventional loom the pick insertion rate is very low compare to the air jet loom. In conventional loom the mechanical or hand shuttle reach the weft thread to the fell of the cloth, but in air jet through air force this is done, here uniform let up, take up, uniform picking, uniform bet up is possible. It has the automatic weft repair device. Left side warp yarn is loose. Air jet loom has some disadvantages like as floating the yarn into wrong direction. To get the better result these main disadvantages must be reduced. 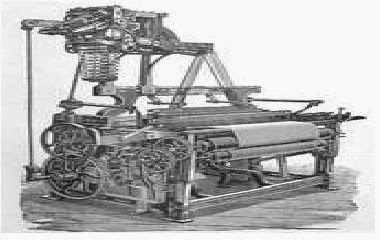 The first loom to make use of a water jet for insertion of weft was developed by Satyr.The loom was first shown at the Brussels textile Machinery Exhibition in 1995. Weft and warp yarn must be insensitive .i.e hydrophobic in nature. Thermoplastic yarns offer the advantages of severance of weft by a heated blade and the provision of a heat selvedge by fusing. It has required miniature pump to feed water under pressure to the nozzle. The water jet loom demonstrated at ITMA ASIA 2005 as a concept model now has debuted as the “ZW8100.” The new model “ZW8100” inherited the basic abilities of the “ZW series” that has enjoyed an excellent reputation as the global standard water jet loom and has enhanced stability at high speed. The ZW8100 intends to succeed and advance the long-cultivated basic abilities of water jet looms – weaving technology, high- speed ability, quality, and energy-saving – for the next hundred years. Tsudakoma consistently emphasises the basic abilities: high speed, quality, versatility, eco-friendliness. Tsudakoma particularly focuses on ultra high speed ability - the mission of all jet looms. Because it considers ultra high speed as the base, Tsudakoma has optimised the frame structure, the beating system and the shedding system, and employs a newly-developed nozzle. A navigation system that enjoys a good reputation for air jet looms is also employed while taking careful note on higher versatility and better operability. To give the best answer to reply to market demands, fulfilling basic abilities is indispensable. Flexibility to woven material is also increased. True user-friendliness is attained. The ZAX9100 is well-established for its ultra-high speed ability. 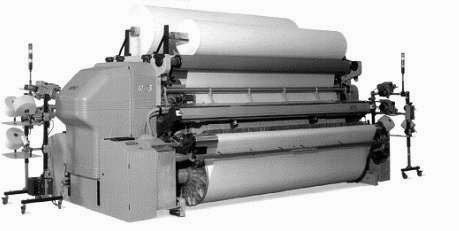 The “ZAX9100HD” is a package model that can weave heavy fabrics at high speed while keeping quality high with enhanced basic abilities and new technology. Tsudakoma’s unique heavy-duty structure responds to user’s strict quality demands. The exhibit demonstrated weaving quality yarn-dyed shirting at high speed. The ZAX9100 is ranked as a premium air jet loom provided with the “Weave Navigation System.” It handles diverse responsibilities, such as being cost-competitive, quick style change, value-added fabrics, and developing new fabrics that will be required more than ever. The ESS Electronic Shedding System, 6-colour weft selection, and the PSC support weaving value-added fabrics of various kinds and thickness wefts. The PSC Programmable Speed Control controls the rpm per one pick according to weft kinds and fabric weaves in order to attain stable weaving, thus the operation efficiency is considerably increased. Fabrics formerly limited to rapier looms are woven easily keeping quality. Tsudakoma has the largest air jet terry weaving experience in the world. Many terry weavers consider Tsudakoma’s air jet looms the standard. While fusing the ultra-high speed ability of the ZAX9100 with its abundant terry weaving know-how, various elaborately designed towels such as pileheight changes and pile-cycle switching between 3 to 7-picks can be woven with a pleasant texture. In combination with the electronic Jacquard motion higher value-added terry cloth can be woven. The “Versa-Terry System” is the integration of Tsudakoma’s terry weaving technology. Various systems that Tsudakoma developed especially for terry are enhanced and new technology for weaving diversified terry cloth designs is employed. The “Versa-Terry System” inherits and advances the thorough experience of the world’s largest record of air-jet terry weaving machines. Improving all of its basic abilities: speed, versatility, quality, energy saving, operability, the ZAX9100-Terry realizes true user-friendliness. "Zero Speed" steering effect provides 360° thrusting ability for docking and holding stationary. Sideways movement possible with multiple jet installations. No difficult engine alignment problems. Water jet loom is produce shed by using the high force of water. In the weaving I think that is a tremendous invention. The phase number of a loom is defined as the average number of shuttles or weft carriers inserting weft simultaneously. It is shown that existing multi-phase looms must have high phase numbers to compensate for their low shuttle velocity. The analysis suggests that looms with high-velocity flying shuttles would achieve equally high weft-insertion rates with moderate increases in the phase number. Such moderate increases in the phase number can be obtained by dividing the shedding and beat-up motions into a comparatively small number of sections. The suggested alternative would avoid many of the textile and engineering problems arising in existing multi-phase looms. A multi-phase loom with magnetic shuttle features that the spiral reed blade with shuttle path is used for beating-up. The linear motor is used for wefting, the heald wheel or electromagnetically excited heald needle is used for opening, and the weft opening with off-line multi-path asynchronous weft replenishing is used. Its advantages include high efficiency, high speed and low weaving cost. The multiphase loom can form many different sheds at different places, thereby enabling insertion of number of filling yarns, one behind the other. An analysis of the factors determining the weft-insertion rate of weaving machines shows that these factors are essentially the same on all looms in which shuttles or weft carriers are used, such as conventional shuttle looms, gripper- shuttle looms, and multi-phase looms. The multiphase loom is the modern invention of the new era. For the excellent loom speed and weaving speed it is now very popular to the many industrialists. But here in Bangladesh the multiphase loom are not available in every factory due to its higher cost. We think in Bangladesh if this machine being available then many weavers will get the real benefit of the multiphase machine. The features of the Modern loom versus conventional loom indicate the main advantages of the modern loom. The difference between the shedding stop motion and driving mechanism is mainly described in this paper. We think the creating activities of this assignment will help us in our practical life to get our higher education.